Just when I thought winter was over the temperatures dropped and the snow returned. Not a lot of snow mind you, but still. . .it's not spring yet, Toto. I want to thank all of you for the lovely comments you left on my Angie's List Weekly Feature post. I appreciate being able to share a special event like that with all my friends, whether they leave a comment or not. It surely gives me a big boost, though, to hear from you. You really are The Best. I also want to thank Connie of Crafty Home Cottage for the gift she recently sent to me. Aren't these kitchen towels sweet? Connie made these for me as a "housewarming" present. Look at the cute gift tag, which I suspect is one of her own designs. I have no idea what she means because the towels are perfect! I think most everyone knows Connie. She's a very popular blogger and extremely creative. I'm honored to call her my friend. (We've met in person, you know.) 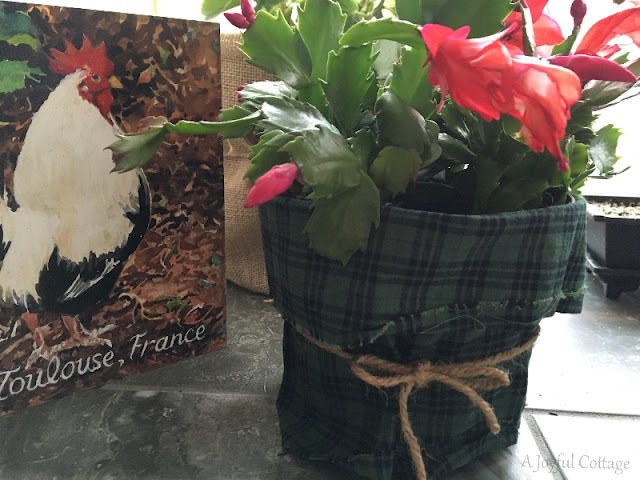 Just in case you've somehow missed her wonderful blog here's the link to Crafty Home Cottage. Before this latest cold snap I managed to get some work done in my flower beds. My 91 year-old friend Barbara dug up some of her blooming crocuses and gave them to me. I planted them in my perennial bed. Unfortunately, a critter (probably a deer) made a meal out of half of them and this is all that's left. I've been covering these at night in an effort to save them, and now I'm thinking I'd like to make some garden cloches like this one for keeping munchers at bay. Wouldn't this be a charming addition to a cottage garden, just for those plants that need protection? I love this. I admire all the spring and Easter decorating I've seen on other blogs the past few weeks, especially all the bunnies and eggs. I think I may have mentioned that I don't do a lot of holiday decorating, aside from Thanksgiving and Christmas. 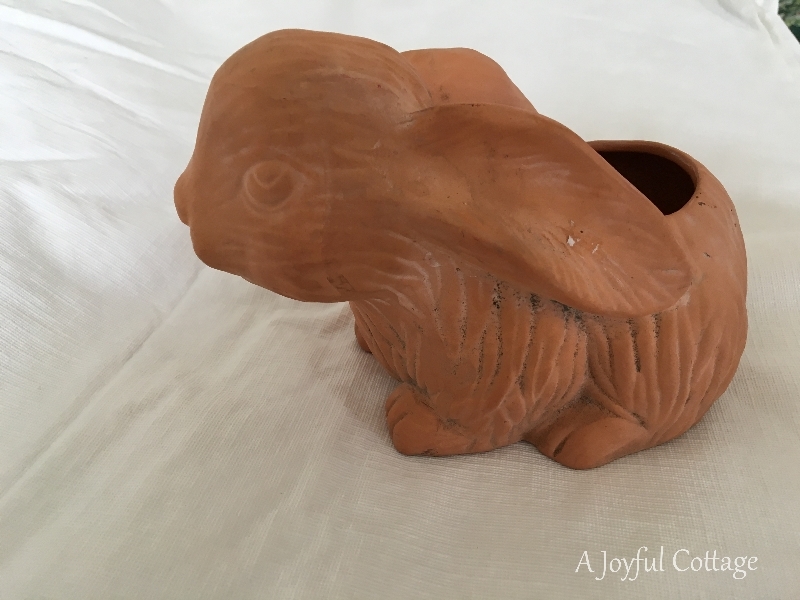 I did, however, find a sweet bunny at the thrift store last week for $1, so I brought him home. He's getting a makeover now. I'm not sure how I'll finish him off, but once he's ready I'll plant a little flower in him and he can hang out with me all spring and summer. Do you ever look at something in your home and suddenly get a hairbrained idea to change it up a bit? That's what happened to me while I was up to my elbows in dishwater, staring at the Christmas Cactus in the garden window. The wintry green plaid fabric around its pot needed to go. So I dried my hands and looked through the fabric scraps stash until I found an old round tablecloth with a ruffle. I snipped off some of the ruffle and wrapped it around the pot with a twine bow. Just a little cottagey fun that brought some cheer to my kitchen. To tell you the truth, I think it looks like the plant is wearing a strapless sundress. Hah! I'll probably trade it for something with a little more class. Did I hear the word "decoupage"? Why yes, I believe I did. And finally, I bid you a joyful St. Patrick's Day. I like the little baggis! Oh what a sweet bunny!! Those towels are lovely, too! SO sweet of Connie! Deer love to snack on tulips, too. The cloche idea is very clever. Love the towels and the gift tag. I with you--hurry up Spring! :-) I love the sweet towels and that cute little bunny makeover. The garden cloche idea is brilliant! I think I may have to make a few to keep the (not-so-cute-when-they-eat-my-plants) bunnies at bay in my backyard. Hi Nancy, Your flower pot cover is adorable. I love it when a simple little quick fix turns out so pretty. I have some chicken wire stashed somewhere around here and I just might have to copy that garden cloches . . . I love that idea. Thank you for the link to my blog; I am delighted that you like the towels. Your lovely garden window was my inspiration. Very sweet towels, very sweet gifting. I love crocuses, especially the Purple ones, darn critter/deer. I have problems with squirrels - I plant and they dig up the fresh dirt flinging, stomping and planting nuts!!! So I have started to top my planters with pea gravel. The news is threatening us with a bit of snow, mid 80's last week to snow??? I was planning to buy Purple pansies tomorrow ... Stupid spring snowstorm. Loving your bunny redo - seriously a buck? Cute steal oh I meant find! Hurry Spring your fans are waiting for you. I feel so bad about your crocus, Nancy. Have you ever checked out Hometalk.com.? You can pick a category like gardening, among others, and ask a question. Then all sorts of 'real' people weigh in. I received a lot of advice on opossum living under my shed. Very enlightening. So, you may find some great advice on those beautiful but pesky deer! Dearest Nancy, good morning to ya! Like you, we have had a taste of early spring but reality has set back in! On my way home last night, it was snowing - lightly, but it was SNOWING, like the way it should in March in Minnesota! But we are all waiting and suffering a bit from Spring Fever!!!!!!! 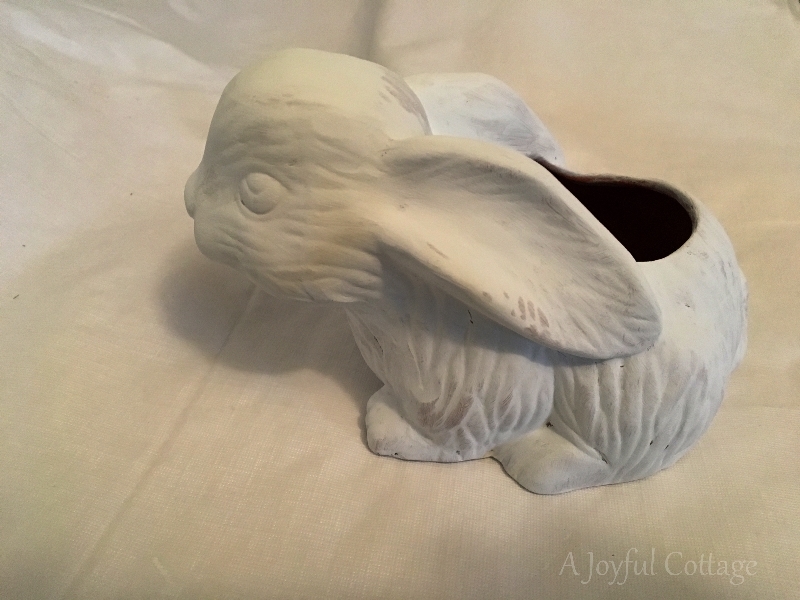 Your transformed bunny pot is special; white paint does WONDERS on so many objects and makes them fresh and new for spring. What a sweet gift from Connie! That wire cloche is wonderful....looks hand made? I want to copy it! Your makeover bunny is too cute and the plant does look like she has a sundress on....very cute! 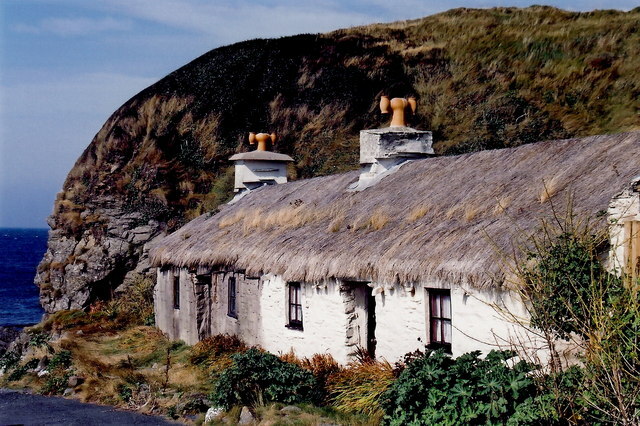 Oh, that thatched cottage! Can we get some interior shots so we can dream?? Have a wonderful weekend! Sweet post . . . Right you are about the weather . . .
We were nice and toasty warm and now we are frigidly cold . . .
was damaged in the high winds this week. I plan on some "doctoring up" today . . .
Love your gifts . . . sad about the critters eating your crocus . . . Cute idea for prevention though . . .
Strapless dress is a hoot and I look forward to seeing the bunny redo! 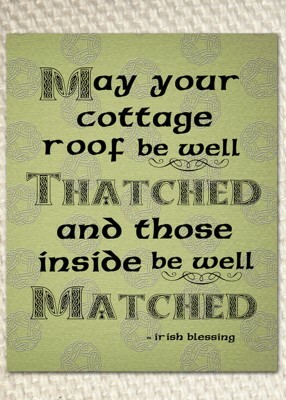 Loved your Happy St. Patrick's Day quote and thatched cottage picture . . . It looks like spring to me! We are in the midst of a winter wonderland.....again. We got our first spring snowstorm on Tuesday and I hope it's the last! 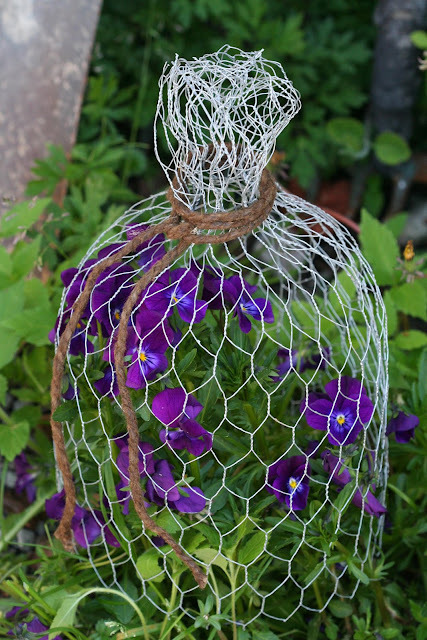 I love the idea of little chicken wire cloches to protect your tasty flowers from the deer! Awwww what a cute little makeover, for your plant. 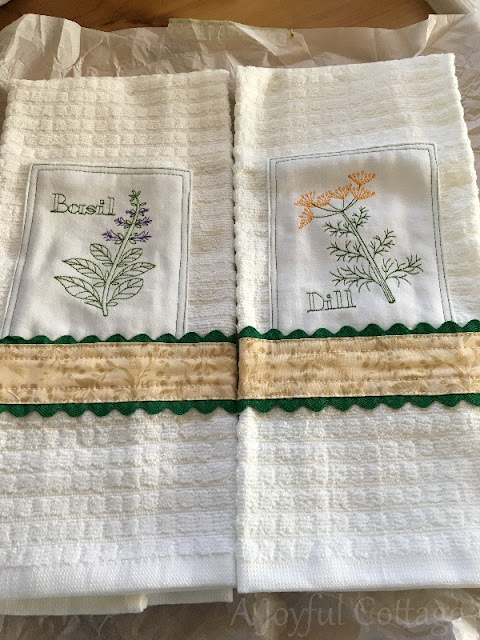 I love the towels Connie has sent to you, my dearest Nancy, I went to visit her blog and she really makes so many works of art ! 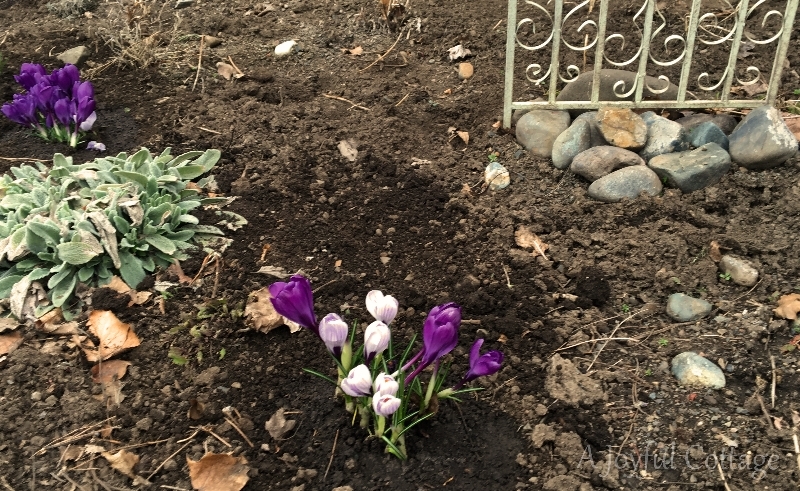 I'm sorry for your so wonderful crocuses, but for sure their bulbs go on living, and will flower next Spring, you'll see ! The gifted towels are very pretty! Indeed a useful gift. Hope your St.Paddy's Day has been great! Pretty re-do with the Christmas cactus. The thatched cottage is so cute I love when I see them in movies. It is the only way to see those for there are none like that around here. :) Hugs from North Dakota! 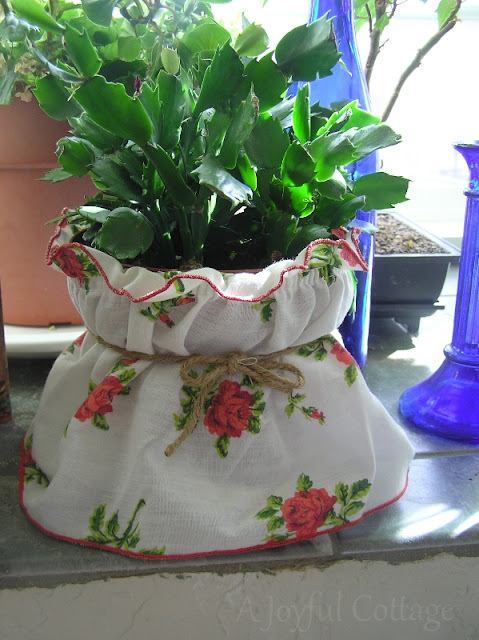 The towels are a sweet gift - and the garden cloches are very clever - I need them for my tulips to seep the deer at bay!! What beautiful gifts to get from a great blogger like Connie. I like reading her blog too. 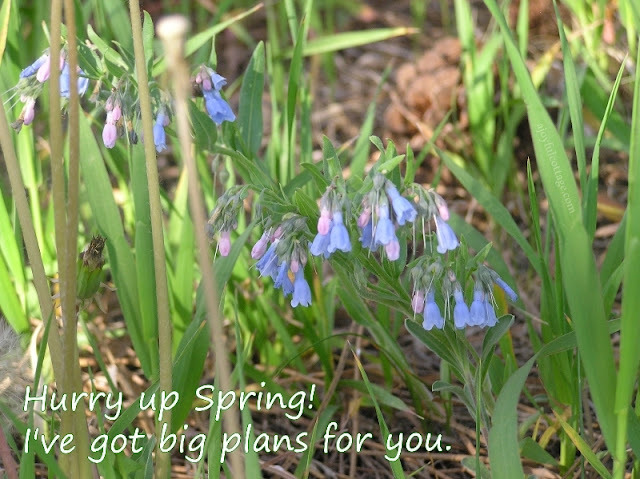 You are ready for spring. We are going to have alittle snow tomorrow,but next week it will be in the 70s. Spring has been springing here, too. Daffodil greens and tulip leaves are poking up. The garlic I planted last fall is growing, too. Saw a flower on the vinca vine beneath the birch tree in the back and found remnants of lettuce, carrots and onions from last year starting up again. Lots of cleanup work to do and now we've got a covering of snow, but knowing that gardening season is on its way makes everything better! Hope you're enjoying the change of seasons, too! I can't wait for spring to really settle. I love the idea of the wire cloches to keep animals away.